I found this image on my del.icio.us feed. 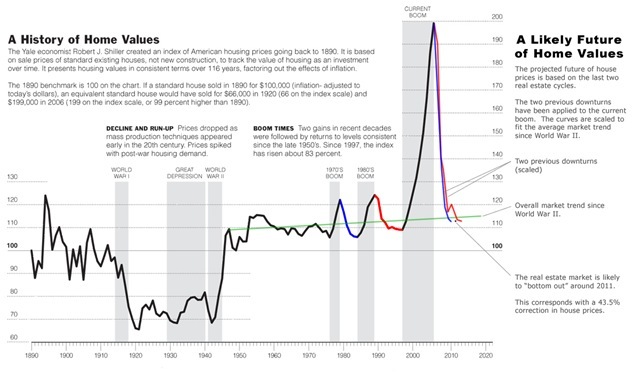 I believe the Internet source of the graph is actually from a post written in 2006 titled “How Far Will Your House’s Price Fall?” on the Capitalism 2.0 blog. I believe the original graph may have been created by Shiller. Reading this post for the first time in 2008 I think it is interesting to note that the graph appears to show the same trend as the graph I did in Excel this year. 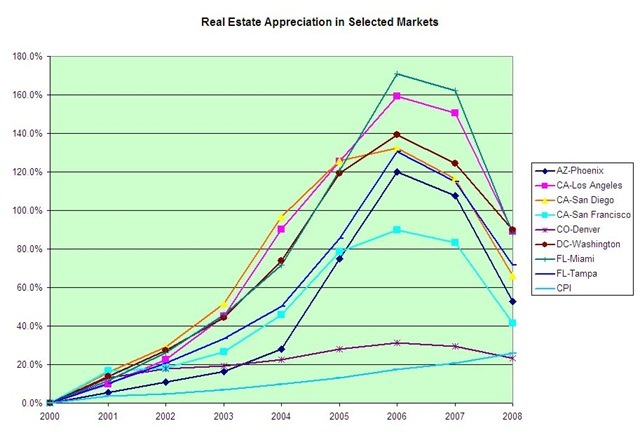 However my graph shows the actual Case-Shiller numbers through 2008 while the 2006 graph is a projection of the future written in December 2006. The portion of the 2006 graph predicting a steep decline in home values appears to follow the actual results in 2007 and 2008. The most ominous thing I see in the 2006 prediction is that he is assuming that we have a basically sound economy like we had in the two previous declines. This is a debatable choice. I think the problems in those recessions are considerably less severe than today’s economic problems. Maybe I have a rosier view of the past but this recession looks like it is going to be much worse for a much longer period. The magnitude of the decline is much larger and the economic problems are more severe. The 2006 prediction of a 2011 bottom in home values just below the trend line may be too optimistic. This entry was posted in Housing Issues. Bookmark the permalink.